Warner has consolidated some of Repin�s well-known discs into a slip-cased four CD box. Each disc has decided virtues and in the case of the Tchaikovsky � which he recently re-recorded with Gergiev (coupled with the Miaskovsky) - his earlier traversal is the more convincing. The discs show him in the round as concerto soloist and recitalist and at the embryonic stage of his musical friendship with Roby Lakatos � in the Louvre concert, though there�s less than three minutes of that collaboration. The Tchaikovsky is straightforward in the best sense; the tone is focused and sweet, rhythms are buoyant and there�s considerable precision over articulation and passagework � especial care is taken when it comes to diminuendi. It�s a relatively measured performance, lyrically shaped in the slow movement where he�s slightly slower than with Gergiev and good in the finale. Maybe it�s not the most arresting of readings but it�s thoroughly convincing. The same is true of the Sibelius where Krivine brings out some nobly moulded string writing from the LSO and where Repin avoids the bleached effect so indulged by violinists who offer musical incident over musical architecture. His is a richly romantic reading � clean, unaffected and sensitive without perhaps the last ounce of individuality to elevate it to the higher echelon. He joined with Menuhin in these three Mozart Concertos. Interestingly he confesses to mixed feelings about the one I admire the most, K218, which he didn�t then play in public � I don�t know if he�s been subsequently reconciled to it. His Mozart has sweetness without raffin�. Accents aren�t detonated, Menuhin is acute when it comes to the weight of string attacks, notably overlooked bass lines � see the opening of K216 for that. I liked the earlier Concerto as well which is very justly scaled; the Turkish gets a most affectionate slow movement and he digs into his lower strings in its finale, egged on by the capricious orchestral pizzicati. His Prokofiev disc is particularly successful due in no small measure to his collaboration with Boris Berezovsky. Highlights are the precision of his rhythmic free fall of the Scherzo of the Second and the particular nature of his characterisation of the First � where his sense of intimacy and withdrawal is most affecting. I was lucky enough to have heard him earlier this year � quite unexpectedly � at the Wednesday afternoon public rehearsal concert that the Concertgebouw Orchestra gives. He played the First Prokofiev Concerto and served renewed notice that he is one of the most adept and understanding interpreters of the composer now before us. The final disc is a chamber collaboration. His Debussy is more obviously expressive than a natural aristocrat such as Grumiaux � but also more brittle. Berezovsky brings out the wit of his part but overall Repin seeds to Grumiaux�s pawky humour in the second movement. He employs a desiccated vibrato to start the last movement and then screws up the tension; it�s an engaged performance but only a partial one (a few noises off when it comes to the violin sound, as well). He deploys a charmingly feminine sound at the start of the Schubert in what is a most attractive performance, albeit the piano sometimes covers him in the Andantino. He�s joined by Anton Barachovsky, who plays Violin I, in a first class performance of the Prokofiev Sonata for two violins, the expressive highlight of which is the Commodo third movement. He plays the Blues � only � from the Ravel Sonata and is then joined by the Lakatos band for a brief Dinicu � good fun though a touch messy. 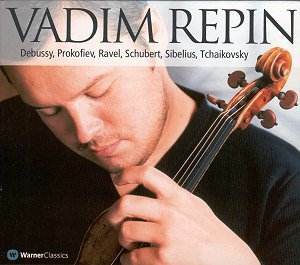 For admirers of Repin who�ve not yet caught up with these recordings, made in the half decade between 1994 and 1999, I can certainly recommend this conspectus. They show maturity and sensitivity in equal measure.